As part of the celebrations of the 60th Anniversary of the Founding of the IUCr, a special Commemorative Photographic Exhibition was mounted during the 21st International Congress of Crystallography in Osaka. The Exhibition took the form of a large number of posters collecting portraits and informal snapshots from major crystallographic meetings and events spanning the Union's history. Congress participants were invited to identify the individuals featured on each photograph. Contributors to the Exhibition included Bill Duax, Gernot Heger, Chris Gilmore and Syd Hall. Bill Duax presented a special session describing the stories behind many of the photographs on the final day of the Congress. 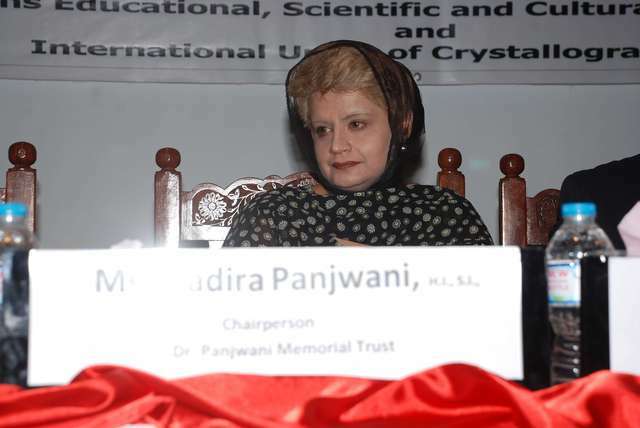 Following the interest generated by this Exhibition, it was decided to establish a photograph archive hosted on the IUCr web site, providing general access to this large and still growing collection of images of crystallographers. This part of the IUCr web site allows users to browse the archive by year, and by major events and gatherings within each year. It is also possible to search the archive based on information likely to be found in the picture caption (usually participants' names) or description of the event. The presentation of results is visual: each photograph is shown as a thumbnail with an abbreviated caption and its associated information. Clicking on a thumbnail will show a medium-resolution view with full caption in a separate window. In most cases, there is a further link from that window to a higher-resolution version of the image, suitable for printing or for examination of fine detail. The photographs in these collections represent, for the most part, candid snapshots of crystallographers at work, at national and international meetings, and occasionally at play. Although they include some official photographs from major events, primarily they document the lives of crystallographers as seen spontaneously by their colleagues and friends. Other sources exist for formal portraits suitable for use in biographies, memoirs etc. : for example the archive collections of learned societies such as the American Institute of Physics (the Emilio Segrè Visual Archives) or The Royal Society, national collections such as the Dibner Library of the History of Science and Technology, the US National Archives or the UK National Portrait Gallery, private organizations such as the Wellcome Trust, the Nobel Foundation or the Nobel Laureate Meetings at Lindau, and commercial or agency services such as the Science Photo Library or Getty Images. A growing number of such collections may also be accessed through flickr. The IUCr is happy to host collections from individual crystallographers, who should contact the IUCr Webmaster in the first instance. Note that the main purpose of the archive is seen as providing an extensive photographic record of the crystallographic community; we may therefore be selective in the images from an individual collection that we make publicly available. Contributors are requested to consider posting their images under a Creative Commons Attribution Licence (see next section). Photographs of past events, especially from the early days of the IUCr (and before), will be particularly welcome. However, the IUCr cannot act as an archive for original photographic prints, negatives or slides (we simply do not have the capacity or appropriate climate-controlled archive facilities). Each individual photograph page identifies the person (or group) contributing the photograph. Among the large number of photographs from Asia and the Pacific contributed by Syd Hall, many individual images have been supplied by the following people, to whom special thanks are due. From Japan: Tamaichi Ashida, Atsushi Nakagawa, Nobutami Kasai, Yuji Ohashi; from India: M. V. Vijayan, Gautam Desiraju; from Korea: Se Won Suh; from New Zealand Jan Wikairi, Jim Simpson, Ward Robinson, Renu Kadirvelraj; from Australia: Steve Wilkins, Hans Freeman, Brian Skelton, Peter Colman. These photographs are made available for the enjoyment and use of the community at large through the generosity and good will of the contributors. Please therefore respect their intellectual property rights. Each photograph is accompanied by a statement of copyright holder and conditions of re-use. Many of the photographs may be re-used according to the terms of a Creative Commons Attribution Licence. In brief, under this licence you are free to copy, distribute, display, and perform the work and to make derivative works, under the condition that you must give credit to the original creator. Some of the photographs are shown as 'all rights reserved'. For these, if you wish to re-use the image, you should contact the copyright holder to discuss the purpose of intended re-use. In putting together a collection of this size, it is possible that the IUCr has misunderstood or misrepresented intellectual property rights associated with some of the images. If you believe this to be the case, please contact the IUCr Webmaster so that we can make the appropriate correction.